1285868579 -Prepare for a career in network administration using Microsoft Windows 10 with the real-world examples and hands-on activities that reinforce key concepts in MICROSOFT SPECIALIST GUIDE TO MICROSOFT WINDOWS 10. 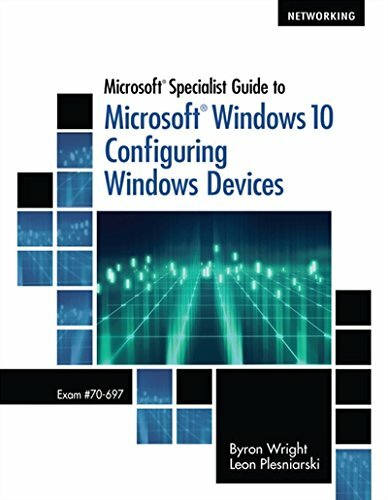 This book also features troubleshooting tips for solutions to common problems that you will encounter in Windows 10 administration. This book’s in-depth study focuses on all of the functions and features of installing, configuring, and maintaining Windows 10 as a client operating system. Activities let you experience first-hand the processes involved in Windows 10 configuration and management. Review Questions reinforce concepts and help you prepare for the Microsoft certification exam. Case Projects offer a real-world perspective on the concepts introduced in each chapter, helping you prepare for even the most challenging situations that must be managed in a live networking environment.